Pegasus Apparthotel is a new apparthotel with 23 new, stylish furnished and fully equiped flats and apartments. 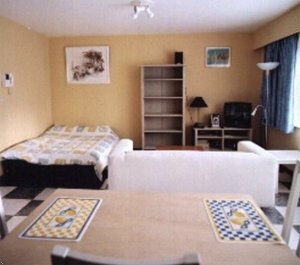 We are located in a quiet but very central area in the north side of Brussels. Our poolhouse, with large sauna and health spa gives you the perfect distraction after your business or leisure activities during the day. 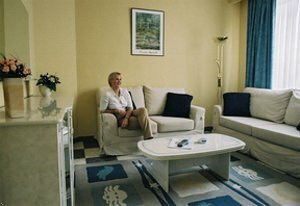 The accommodation that we offer, allows you to feel at home far from home, and we give you the appropriate service to guarantee this feeling. 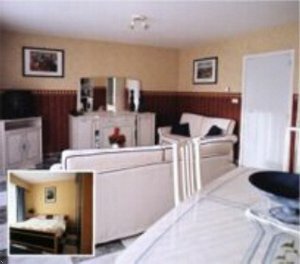 Standard suite with double bed or 2 twin beds. Suite includes coffee/tea maker, full kitchen, microwave, VCR, cable TV, mini bar, balcony, fax in room, separate bathroom, stereo system, phone line with private incoming number and extra line for data transmission, modern and stylish furniture, table/chairs, and sofa. Executive suite with king bed. Brand new apartments, in separate building opposite to the main building. Suite includes coffee/tea maker, full kitchen, microwave, VCR, cable TV, mini bar, balcony, fax in room, separate bathroom, hairdryer, stereo system, phone line with private incoming number and extra line for data transmission, modern and stylish furniture, table/chairs, and sofa. Executive suite (Penthouse) with 2 king beds. Roof apartment with elevator entrance directly into the living room. 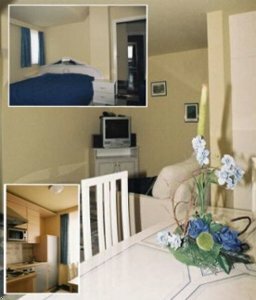 Suite includes 2 separate bedrooms, coffee/tea maker, full kitchen, microwave, VCR, cable TV, mini bar, fax in room, balcony, separate bathroom with whirlpool, stereo system, phone line with private incoming number and extra line for data transmission, modern and stylish furniture, table/chairs, and sofa. Please contact the hotel for directions information. 8.87 miles northeast to the property. 4.65 miles east to the property.